A well-established family run restaurant in the centre of Twickenham, Miss Siam offers an enviable range of superb authentic Thai dishes, all freshly prepared and cooked to order. 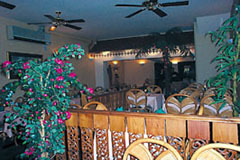 Combined with warm, friendly service this charming restaurant is the perfect venue to enjoy a relaxed evening meal. Open Mon-Sat 6-11.30pm, Sun 6-10.30pm. All major credit cards accepted (not Amex/Diners). No service charge. Authentic Thai dishes, all freshly prepared and cooked to order. Take-away menu available.